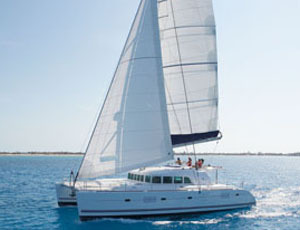 The Beneteau Lagoon 500 is a luxury sailing catamaran available for bareboat charter in the Virgin Islands and the Grenadines Islands of the Caribbean Sea. This stunning yacht can accommodate up to twelve guests in four spacious double cabins, with ensuite bathrooms as well as a small twin cabin with bunks and two single cabins in the bow that can accommodate crew or children if you wish to bareboat. The single cabins in the bow are entered from the deck. 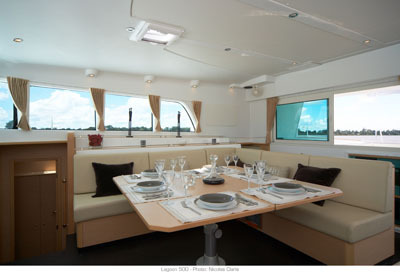 There are few vessels available for bareboat hire that can accommodate more than 10 people and the Lagoon 500 offers comfort and style for up to 12 making it the best choice for large groups. A true luxury bareboat, the Lagoon 500 is the big sister to the very successful and popular Lagoon 440, blending innovation and quality in equal parts. From the fly-bridge steering station to the ingenious rumble seat cockpit forward to the stunning interior, the Lagoon 500 leaves an indelible impression. 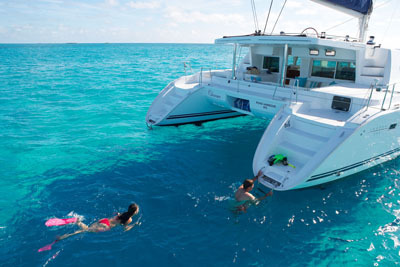 The designers were instructed to design a catamaran for world cruising that included just about everything you’d want or need at home, and they have delivered just that. The Lagoon 500 has a spacious and light filled galley and salon, roomy cabins and plenty of outdoor deck space for soaking up the Caribbean sunshine. 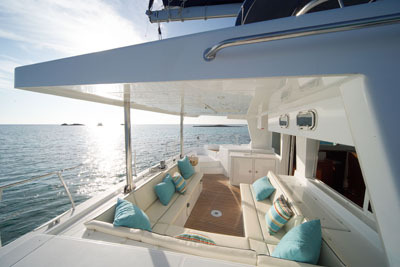 The luxury Lagoon 500 offers an elegant aft cockpit for lounging and alfresco dining. In many ways the cockpit seems like an extension of the saloon as it is accessed by a huge glass sliding door which when opened makes the salon and cockpit one giant space. There is a wet bar to port, just before you enter the saloon that includes a sink, pressure water and in some cases a 12-volt fridge. Charterers access the steering station via curved steps on either side of the cockpit up to the fly-bridge which sits forward of the hardtop bimini protecting the cockpit from the weather and sun. 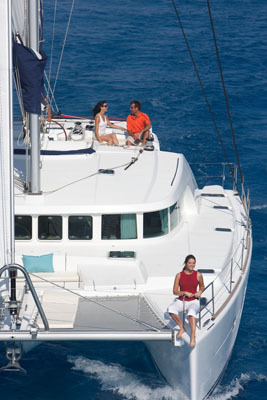 The fly-bridge offers seating for up to six passengers and is the best seat in the house under sail. 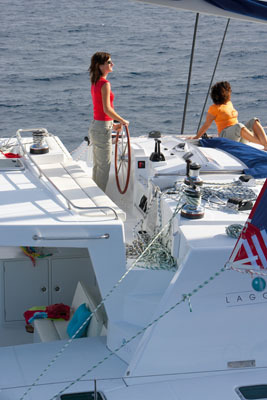 The wide swim platforms in each hull are easily accessed from the cockpit via two shallow steps right down to the water. The steps have lazarettes for stowing snorkel and dive gear and there is a water shower on the port hull. Entering the spacious saloon you are immediately struck by the sense of light and spaciousness. The trademark Lagoon windows provide natural light and along with the four forward most opening port lights, plenty of ventilation too. The expansive galley is to port. 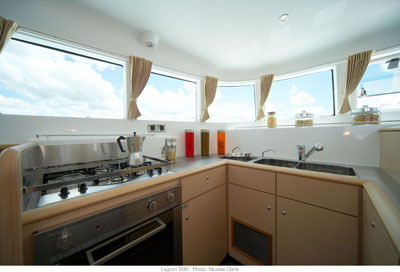 Having two dining areas and the galley up means that food preparation is social and the cook is not missing any of the fun being had on deck. By any definition the Lagoon 500 offers comfort for up to 12 guests and while she is a big boat she is also an easy boat to sail making her an ideal bareboat charter experience. 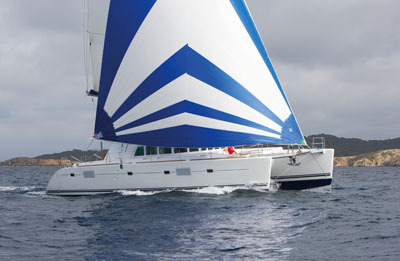 The Lagoon 500 is available from Tortola in the Virgin Islands and Union Island in the Grenadines. 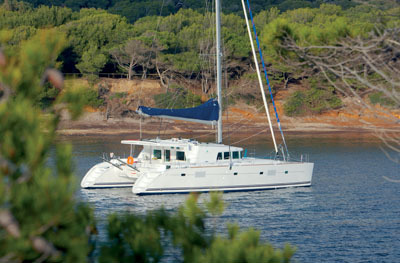 The Lagoon 500 has four roomy double cabins with ensuite bathrooms. 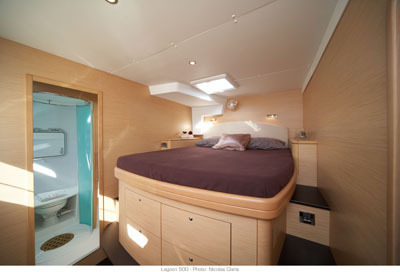 As well as the double cabins there is one very small twin cabin with upper and lower bunks. This cabin is really suited best to children. In addition to the cabins in the interior, there are also two single cabins which can be entered only from the deck. These cabins have been designed as crew cabins but again are also suitable if you have children in your group or lots of singles. 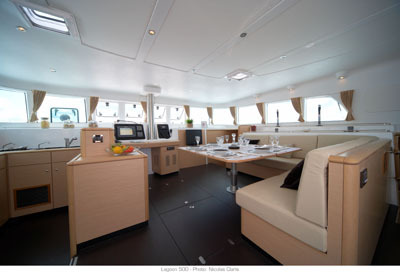 In addition to the cabins the yacht features a spacious galley and cockpit area as well as an expansive deck and fly-bridge and has plenty of space for 12 people to relax and dine. 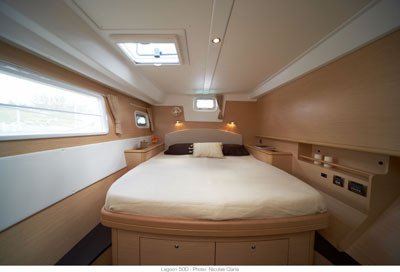 AC, Bath towels, BBQ, Bedding, Cabin fans, Cockpit cooler, Cockpit table, Deck cushions, Linen, Manual toilet, Rigid inflatable dinghy with 15HP, Autopilot, Depth finder, Electrical panel with volt and ammeter, Log/Speedometer, VHF, Wind direction, Wind speed, burners stove and oven, Coffee percolator, Double sink, Freezer, Fridge, Hot/Cold pressurized fresh water, Microwave, Salt water foot pump, AM/FM Radio, CD player, Cockpit Speakers, Snorkeling gear. Lagoon 500 - Indoor dining.